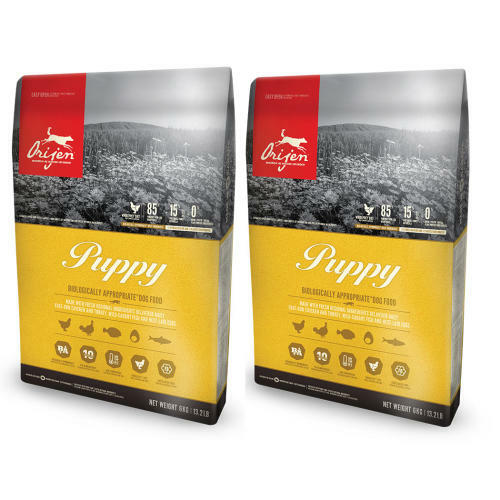 Containing ingredients with a low-glycemic index such as lentils and chickpeas to provide slow burning energy and promote steady levels of blood sugar all day long, Orijen Puppy is chock full of the essential proteins and fats that your canine companion requires to foster strong, stable growth, as well as vitamins an minerals to fortify a flourishing immune system. Crude protein (min.) 38 %, crude fat (min.) 20 %, crude ash (max.) 8 %, fibre (max.) 5 %, Moisture 12 %, calcium (min/max) 1.4 %, phosphorus (min/max) 1.1 %, Omega-6 (min.) 3.0 %, Omega-3 (min.) 1.1 %, DHA (min.) 0.35 %, EPA (min.) 0.25 %, Glucosamine (min.) 1500 mg/kg, Chondroitin sulfate (min.) 1200 mg/kg.